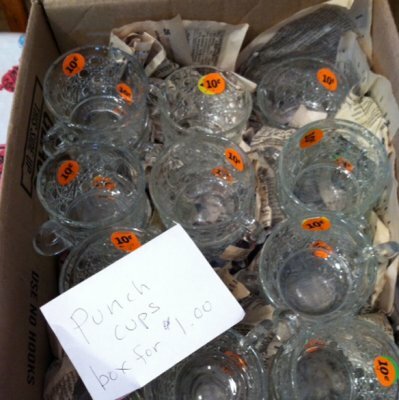 I picked up a box of two dozen glass punch cups at a yard sale for $1. 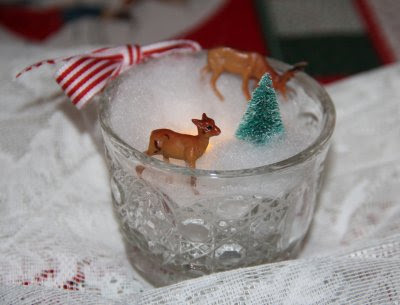 Was thinking on what to do with them (I already have a million for my punch bowl set), and came up with these easy votive candles for Christmas. These votives could also be adapted for most any occasion, especially a wedding. 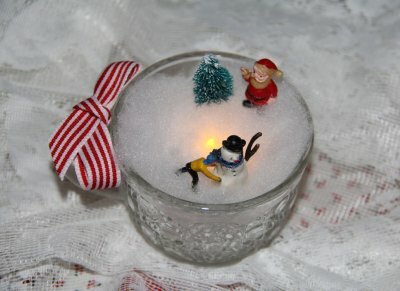 If you can't find punch cups, look for any cut glass items you can find like sherbet dishes, even old jelly jars. You can usually get a whole box of these for $1 or so. Fill the glass cups with whatever you have a ton of - beads, sequins, glitter, candies, even sprinkles. The smaller the items in the filler, the better the presentation. Just don't use anything flammable with real candles. And don't use real candles for kids parties. The cups get hot. Here are three ideas. The nice thing about these is the make unobtrusive table decorations and are great door prizes for people to take home. These would also make an easy, cheap craft for kids to make for their mother/teacher. The possibilities are endless! Use Seasonal Colors of Glitter for other holidays, or Wedding Colors! Tie ribbon on the handle and tie in bow. Cut the tails short. Pour in 1/4 cup glitter. Push votive slightly into glitter. 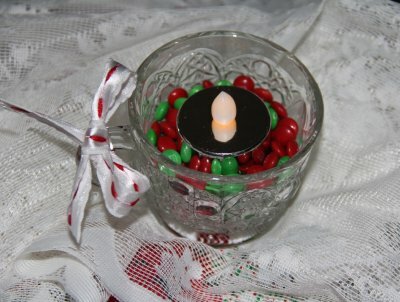 LED votives (I don't recommend the cheapest ones - they are very touchy). Add Fiberfill. Push away from bulb. Add tiny figures. Press into Fiberfill and you won't need glue. Great for kids' parties. Use whatever is appropriate for the season. Candy Corn for Thanksgiving, Starlight Mints for Christmas, Jelly Beans for Easter. Add candies until half full. 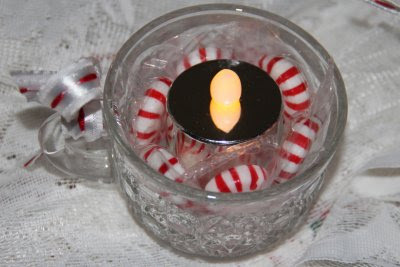 Push votive down into candies. 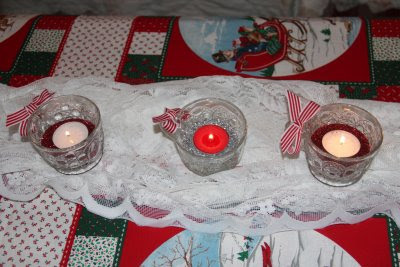 Use a lace curtain (like I did) or lace fabric down the center of a red tablecloth (or printed one like mine). 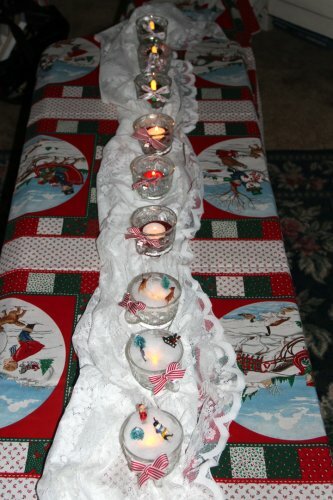 Or just set them down the center of the table and add more candies, sequins, etc. as table scatter. 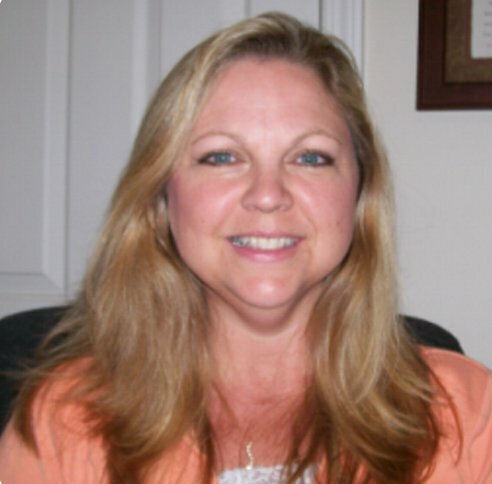 Copyright © 2013 by Cindy Bailey. All rights reserved.